A super walk contrasting a lovely section of the Leeds-Liverpool Canal with the sweeping views and fine summit of Skipton Moor. 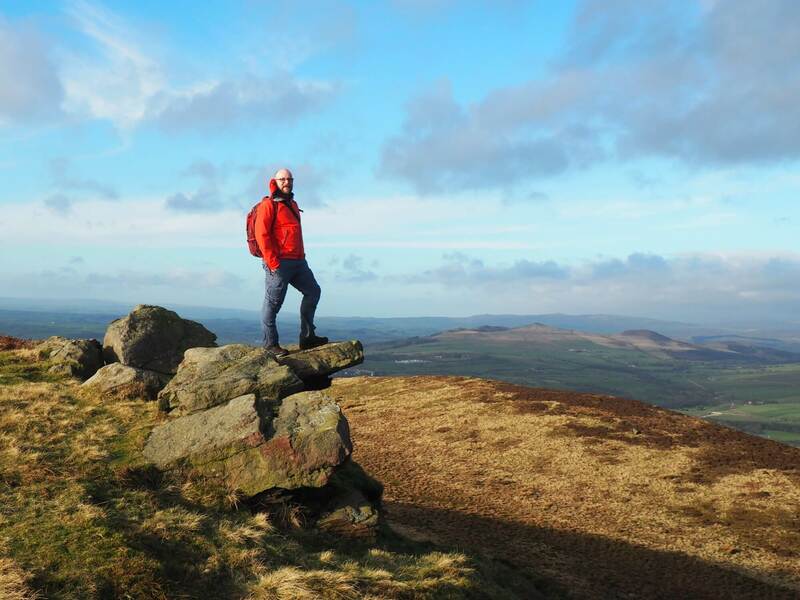 For my final walk of 2017 I decided to revisit one of my favourite ‘lesser’ summits in the Dales – Skipton Moor. Joining me on the walk were Sam and Tony, two of the group with whom I’d done the Nidderdale Way walk earlier in the year. There are a number of different options as a starting point. On this occasion we started at the large car park near the canal front in the centre of Skipton. From the car park we crossed a couple of bridges to gain the towpath on the west bank of the Leeds-Liverpool canal. The next couple of miles was a supremely easy and hugely enjoyable stroll alongside the canal all the way to Low Bradley. From Low Bradley there are numerous paths heading up to the moor above. To keep things simple (and drier underfoot) we kept on the narrow lane climbing up to the small hamlet of High Bradley. From there we continued on a track, Back Lane, passing New Hall Farm. When the track turned downhill for White House Cottage we continued on a grassy path encountering for the first time some moist moments underfoot. Coming to a junction we turned left to follow the path uphill and over a broken bit of wall. The path then climbed up on to Millstone Hill and its scattering of gritstone. The views of the Airedale were already quite superb especially across the valley to Gib and Earl Crag further to the left. Dropping down from Millstone Hill we then encountered Black Sike, the boggy crossing of which I remember from my first visit to these parts a dozen or so years ago. On the other side of Black Sike the path climbed up to meet a wall and onto a stile. This is a superb moment as the view north is suddenly revealed including Skipton below and Flasby Fell, Crookrise Crag and Cracoe Fell beyond. On the other side of the stile we followed a thin path below Standard Crag to then cross a flat section of moor for a final pull on to the summit of Skipton Moor. With a fantastic view, a trig point, cairns and some nice little outcrops the summit of Skipton Moor is one of my favourites. Given the decent sized town at its foot I’m constantly suprised by the fact that the only other people I’ve ever seen up there are those that I’ve taken with me on a walk. Rather than taking the more obvious route back to Skipton we dropped steeply down north from the summit. Passing around the eastern end of a small ridge we picked up a thin path that made its way to the corner of some some woodland. Here the path slanted steeply down to a good path below – the Dales High Way. Turning left on this we enjoyed a nice walk along this promenade. At the end of this we zig-zagged down the woods of Jenny Gill to reach the top of Short Bank Road and the fringe of Skipton. The walk concluded by following Short Bank Road downhill before turning left on to Newmarket Road. This led us back into the centre of Skipton and the end of a really enjoyable outing. Highly recommended. Walked this walk today but in reverse to you, so that we had the easy stroll along the canal to finish off with. Great views along the way, also plenty of interest along the canal with numerous barges meandering along, also an abundance of wildlife. Did you see anyone on the top of Skipton Moor, John? Always amazes me how few people if any you see you there. One of my favourites of the lesser hills in the area.